I have been designing and conducting training games for decades. To support this undertaking, I have read hundreds of articles applauding the virtues and denouncing the deficiencies of training games. I am constantly confused by the use of word game that means different things to different people. Contrivance. A game contains artificial elements that prevent the people from taking it seriously. This contrivance may be related to the goals of the game or its rules. Conflict. A game specifies a goal and places obstacles toward its achievement, resulting in a conflict. Usually, the conflict in a game takes the form of competition among players or teams. The conflict may also occur between the player and previous records, probabilities, mechanical impediments, time constraints, and other such elements. 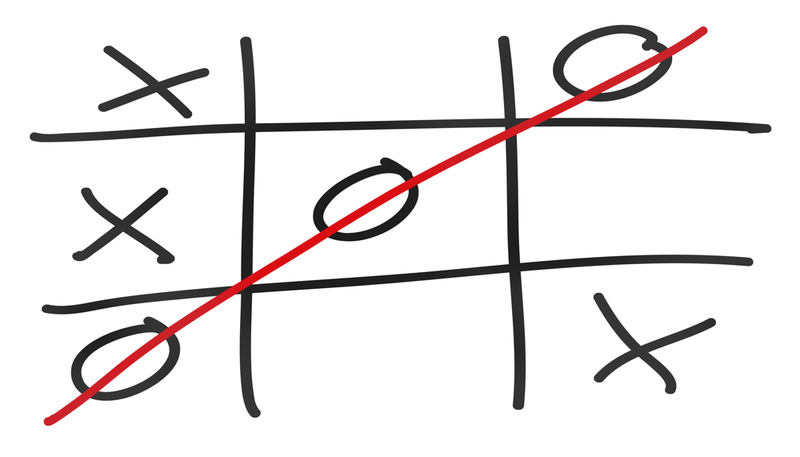 In the game of tic-tac-toe, the conflict is between two players. Control. In a game, rules control the players’ behavior. They specify how each player takes turns, makes moves, and experiences the consequences. The rules of tic-tac-toe include the following: Players take turn marking their symbol in one of the unoccupied boxes. Each player consistently uses the same symbol (X or O) throughout the game. Closure. A special rule in the game (called the termination rule) brings the game to a conclusion. The termination rule may involve the achievement of a goal, end of a time limit, reaching a target score, or eliminating other players. Each play of tic-tac-toe comes to an end when three of a player’s symbol are placed in a straight line. Competency base. A training game should assist the mastery of a specific piece of knowledge or skill. We can convert the game of tic-tac-toe into a training game by requiring each player to correctly answer a test question before being permitted to place his or her symbol on the grid. Correspondence. The objects, procedures, and consequences in a simulation correspond to some real-world counterparts. In other words, a simulation represents reality. In a high-fidelity simulation, the correspondence between the simulation and the real world is comprehensive and detailed. In contrast, the correspondence is limited and metaphorical in a low-fidelity simulation. A training simulation should reflect some aspect of reality that is relevant to the competency. For example, a simulation of a race in which the players answer test questions in order to move their horses across the game board is not a training simulation. Rather, it is a training game that uses an extraneous simulation for keeping track of the players’ scores. Most of the training activities I design are not pure games. Although they are all contrived activities and contain elements of conflict, control, and closure, I frequently discount control and closure and de-emphasize conflict, particularly in terms of competition among players. Technically, I should refer these exercises as game-like activities and not as games. And to avoid the negative connotations associated with the conventional use of the word game, I have begun calling them training activities.